Outdoor adventurers, snowbirds, and local residents love the mild winters here in the Valley, but even mild winter nights can see overnight low temperatures near freezing. Extended periods of nippy nighttime lows keep pool water chillier than most people enjoy, Polar Plunge enthusiasts aside. It’s a relief to many pool owners to discover that the weather doesn’t need to dictate the swimming season – pools are meant to be enjoyed year round. But I already have a cover. A pool cover or solar blanket is a great start to warming your pool’s water and keeping it free of loose leaves and debris. They are limited, however, to retaining heat – they don’t produce it. Only a heater will generate the amount of heat that will truly extend your swimming season throughout the fall, winter, and early spring. The perfect combination of a heater and solar blanket will increase energy efficiency and reduce utility costs by maintaining the heat produced when the pool isn’t in use and slowing the rate of evaporation. What kind of heater do I need? Today’s heating technology is capable of rapid heating and maintaining a perfect temperature. Units are more energy efficient and durable than ever and include propane, gas, electric, and solar options. The type of heating unit that best suits your needs will depend on several factors: property utilities, pool location, surrounding tree cover, size and depth of pool, your installation and operation budgets, and the type of pool you own. Generally speaking, a smaller heater will have to work harder and turn on more often to keep the water temperature up, but a quality pool builder like Caribbean Pools can make a recommendation on which type and size heater is right for your needs. Think about taking the plunge. The best time to install a heater is during new pool construction, but heaters can also be added later during a remodel. 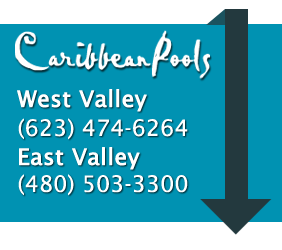 Whether you’re looking to upgrade an existing pool or build a new backyard oasis, Caribbean Pools can help guide you in the decision making process. However you decide to dive in, we wish you happy swimming!